J.J Abrams is clearly a Star Wars fan. That much is clear as you watch the first twenty minutes or so of the The Force Awakens. It feels non-stop and relentless with the storm-troopers, a menacing villain who is not unlike Darth Vader and of course, a message in a droid. It doesn’t let up there either. The movie then quickly relocates to a desert planet and a young, hopeful orphan scrounging for parts and wishing for more from her life. That same droid then brings with it adventure and the opening for a very entertaining instalment in the Star Wars franchise. To his credit, Abrams has brought that “grounded” feel back to Star Wars. Of course there is CGI and huge shiny spectacle but you can’t necessarily see the joins and compared to the CGI heavy prequel trilogy, The Force Awakens relies much more on real, practical effects and is a much better movie because of it. Real explosions, puppets and make-up rather than computers and that almost impossible droid make for the imaginative sci-fi world that Lucas managed to give us in the first place. Of course, effects are not what Star Wars is built on and Abrams has played a very clever move with the story for The Force Awakens; he offers the familiar and successful. There will be many an article dedicated to the similarities between The Force Awakens and A New Hope. The message in a droid, the desert planet, relying on two smugglers to help save the day and then a planet destroying super-weapon. All of these elements come into play and although the package is new, what is running through the movie is very familiar. It does help that there are some old faces lending a hand. One in particular gets thrown into the centre-stage and for obvious reasons. The original Star Wars is arguably the story of Luke Skywalker but Harrison Ford’s Han Solo was the stand-out star. Here he gets to play the old figure, guiding the new characters but at the same time being intrinsically involved in the movie’s events. There are some other cameos by original movie characters, some more effective than others, but Abrams also manages the practically impossible, to introduce new characters that could have held the film on their own. 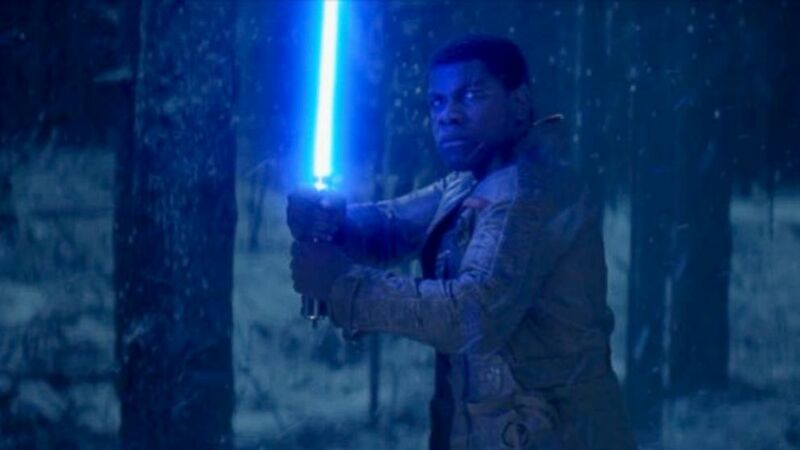 Sharing the spotlight is Daisy Ridley’s Rey and John Boyega’s Finn. Both have great “origin stories” and the chemistry between them, not necessarily romantic, is fantastic. The movie is their story and to say that you want to watch their tale continue is testament to the work that Abrams and the writers did to build believable characters in amongst those that we are already invested in. Star Wars isn’t just about the heroes and we have seen many a Star Wars movie fail due to a poor villain. Adam Driver is superb as Kylo Ren and gets an interesting story arc of his own which will hopefully be developed further as the saga continues. His character design is excellent and although it is clearly supposed to resemble a certain other masked villain, there is enough to make Driver’s character unique, especially his creepy, commanding voice. The final point that a Star Wars movie lives or dies on is the action. There is plenty here and most of it is impressive. Chases through desert towns, battles over ancient monuments and of course the obligatory space encounter all make for impressive spectacles. The other focus point has to be the lightsaber duel and to the movie’s credit, this duel has much more to it than just the bad guy versus the good guy, with some underlying story-arcs playing through the finale. This praise doesn’t mean it is the perfect Star Wars movie though. There are some missteps. After a thrilling first act and plenty of fan service and surprise, the movie seems to run out of steam and stall, trying to fill a lot of backstory and revelation into a small amount of time. That rushed feeling also accompanies the finale, which is that awful gimmick of sequel baiting. The final five to ten minutes of this movie would have been a great first twenty minutes of the next chapter, had the time been given to develop it properly. Overall, Star Wars: The Force Awakens is a fan’s dream return to the sci-fi saga. Returning characters, great new additions and some excellent action intertwine with a knowingly familiar story. There are moments which don’t work and definitely feel rushed but there is also plenty to develop upon and the next instalment can’t come quick enough. Totally agree. The film would still have worked had it only been new characters. Next Next post: Will we ever be this excited about Star Wars again?